It's tomato time!!! I plant cherry tomatoes in my garden and already am harvesting them, little by little. Most of the time I can't even wait to take them back into my kitchen. Instead I tend to munch on them them while watering my garden. There's really nothing like eating a sweet, sun-warmed, perfectly ripe tomato with one hand while holding a hose in the other. There's no point in even mentioning the many ways to enjoy tomatoes. I assume you have your favorites. 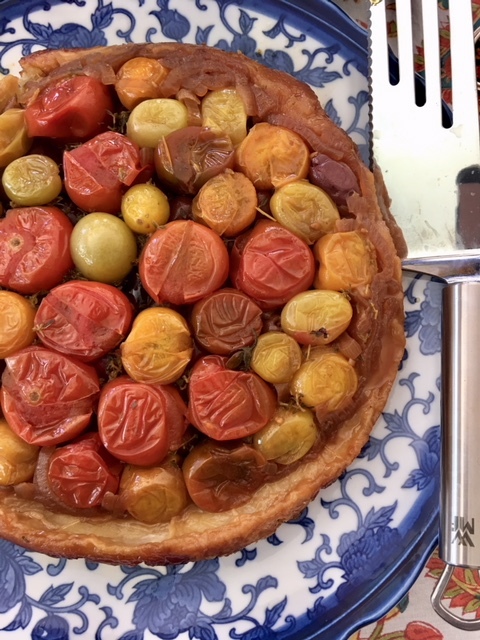 But if you've never tried making a tomato tarte tatin, you're missing out. I made my first one years ago at the home of a friend. She has an abundance of tomatoes on her home's grounds (yes, it's that kind of home; it has "grounds."). One year when she had a bumper crop, she invited a bunch of friends over to make sauce. And I made a tart. It all went well until I took the masterpiece out of the oven and placed it on the stove to cool. 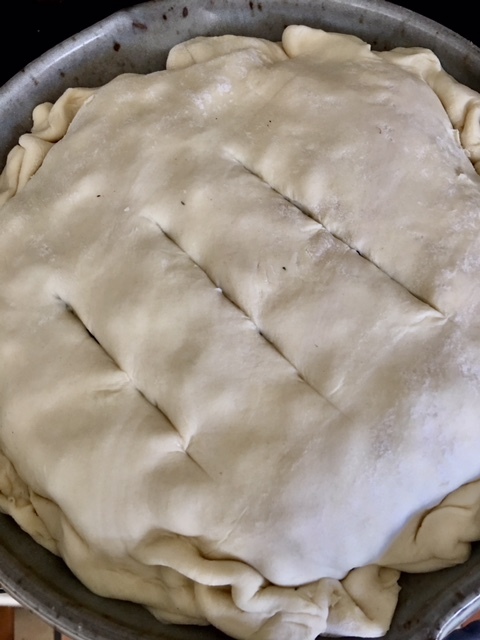 I got involved in something else--I can't remember what exactly--but I needed to move the tart out of the way and unthinking just wrapped my hand around the skillet's handle. And screamed. This past weekend when I made the tart I pulled out the only 9-inch skillet I had, a flameware skillet. If you haven't heard of or used flameware, you're missing out on a great cooking experience. This is a clay cookware that is specially created to be totally heat resistant, that cooks evenly even at high temperatures, and doesn't get killer hot the way metal does. 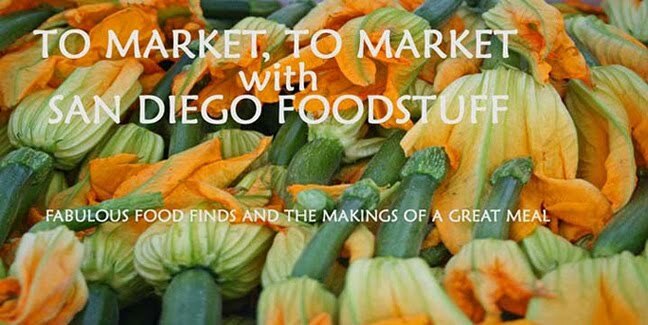 I bought mine online at a Minnesota shop cookbook author Paula Wolfert introduced me to, Clay Coyote. I hadn't made a tomato tarte tatin in a flameware skillet before but it worked out perfectly. 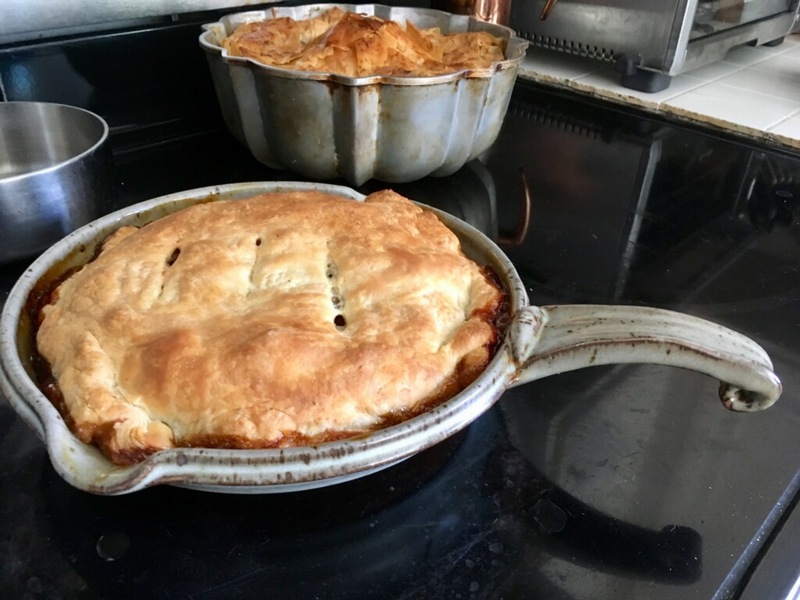 And, significantly, the pan is so light it makes flipping it over onto a plate a breeze, much easier than stainless steel or cast iron, and with almost no sticking--certainly no more than any other metal skillet I've used. The tart itself is a marvel of sweet and savory. 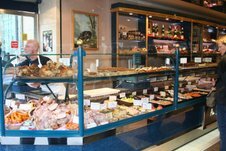 There are several ways to make it in terms of ingredients. Sugar instead of honey, sherry vinegar instead of red wine vinegar. Whole tomatoes, cherry tomatoes. Whole or sliced tomatoes. Onions. No onions. Whatever. The fundamentals are tomatoes, some kind of caramelizing ingredients, and puff pastry. 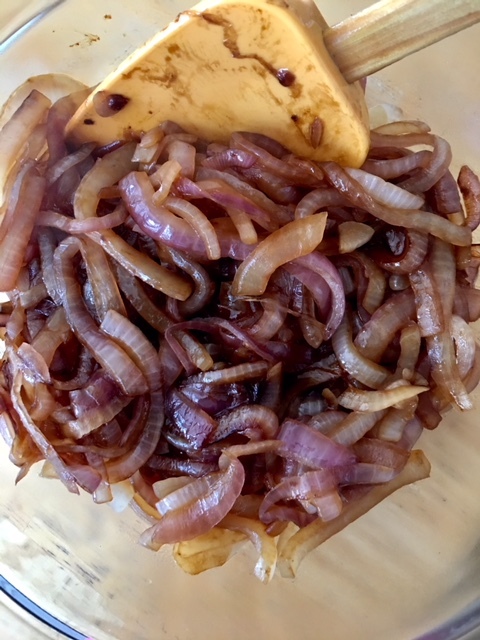 For me, I enjoy a lot of red onions, cooked down and caramelized in butter and a large pinch of brown sugar. Honey and vinegar. Kalamata olives. And, the star of the dish, whole organic multi-colored cherry tomatoes. 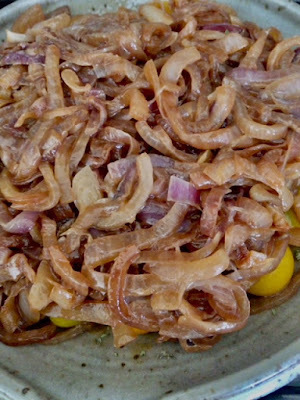 You'll start by cooking down and caramelizing the onions in a large skillet. Put them aside and in the oven-safe, 9-inch skillet you're going to make the tart in cook up the honey and water to a point at which it thickens, then add vinegar and swirl to combine the two. Remove the pan from the heat. You'll sprinkle the olives over the honey vinegar mixture and start building the tart. The tomatoes go in--whole--over the olives, along with finely minced fresh thyme. (Want to use basil instead? Go for it.) They should cover the entire bottom of the skillet. Then you'll spoon the onions over the tomatoes, and season with salt and pepper. Before you put the tart into the oven, be sure to place it on a baking sheet covered with foil to catch the tomato juices so they don't hit the bottom of your oven. Bake for 30 minutes until the crust is nice and puffy and golden brown. Then remove it from the oven and let it cool briefly before running a knife around the edges. Now comes the moment of truth: Select a plate/platter larger than 9 inches. Place it upside down over the pastry. Be sure to use oven mitts or a thick towel and carefully flip the skillet and plate over, place it on the counter and gently lift the skillet. If all goes well--and why wouldn't it--you'll have a beautiful, rainbow of glossy tomatoes staring back at you, encased in a crunchy crust. That's perfectly good enough as it is, but you can also decorate it with a scattering of basil leaves.